Ever been in a situation where you wanted to convert and play audio files from Apple Music, iTunes M4P songs, Audible AA, AAX audiobooks to your favorite mp3 player? Did you face any issue with the same? Were you able to convert and play the audio files? Well, it is never easy to convert and play those audio files as the files are DRM protected. Now, what is DRM protection? Well, DRM protection is a special security mechanism to restrict the access to copyrighted material using technological means. DRM can be used to protect any type of content: music tracks, video files, ebooks, games, DVD movies, emails, documents, etc..
DRM is widely used security mechanism in audio content from apple music, itunes, etc.. And so it gets really tough to break this security and enjoy music as per our will. But wait!! There’s a fix for it. 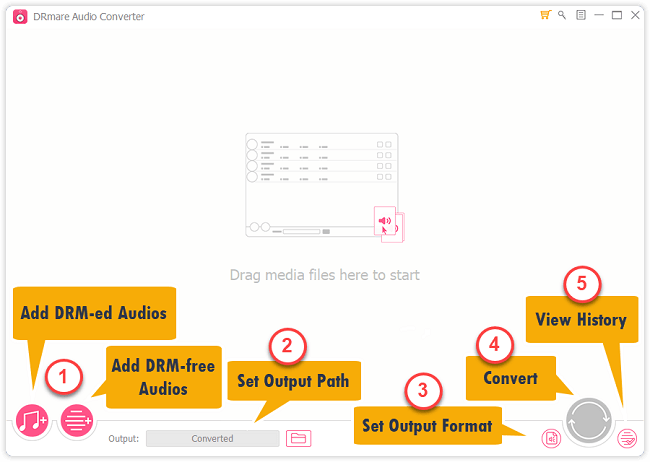 Check out DRmare DRM Audio Converter for Windows. This software can convert all DRM protected Audios, including Apple Music songs, iTunes& Audible audiobooks to MP3 format losslessly. You then will be able to play all Apple Music purchased songs on any non-Apple devices without limitations. With the help of this outstanding DRM audio ripper, you can freely convert and enjoy any streaming music or DRM-ed audiobook on any popular mobile device or MP3 player with complete control. How to use DRM Audio Converter Software? Here is a useful user -guide on how to use DRM Audio Converter for Windows. The guide is very easy to understand. Well, I have download the software on my PC here and I am pretty satisfied with the performance. If you want to play and enjoy apple or itunes music on your mp3 player, you should definitely check out the software. Download it today and have fun! !